If your business is like many other organizations that are in the process of enabling a Microsoft Azure public cloud platform, then you might be struggling with the guardrails needed to secure and manage cost, while at the same time enabling flexibility for the teams consuming cloud services. While the Azure platform is already very secure, it also allows a great deal of flexibility in configuration. In order to avoid accidentally creating security holes and out-of-control spend, a Governance Framework is required. 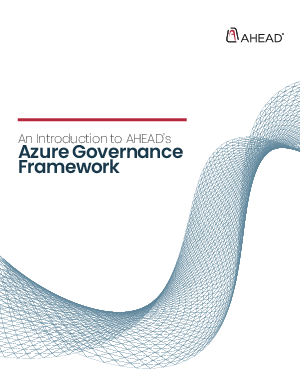 We created the AHEAD Azure Governance framework to allow enterprises to develop and maintain a fully optimized, and secure environment. The resulting framework will be tailored to your organization’s specific business and compliance needs, as every enterprise is different. This guide will introduce you to the components of this necessary Azure Foundational Governance Design.